As you may learned from the evolution path of any wireless communication, the strongest motivation for new technology and new feature is to increase the throughput and/or to increase the reliability of the communication. Some features are more focused on the reliability issues and some features would be more focused on throughput issues. 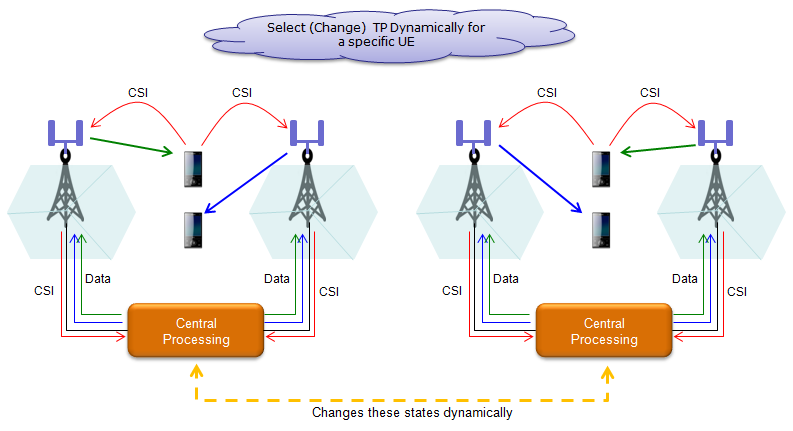 Let's take a high level view of several LTE features of LTE in terms of the two aspects, reliability and throughput. As you can naturally think, LTE development started with SISO configuration (I think this was only in development stage, by the time LTE started being deployed everything was 2 x 2 MIMI by default) and the technology evolved to MIMO. Definately this is mainly for increasing the throughput. 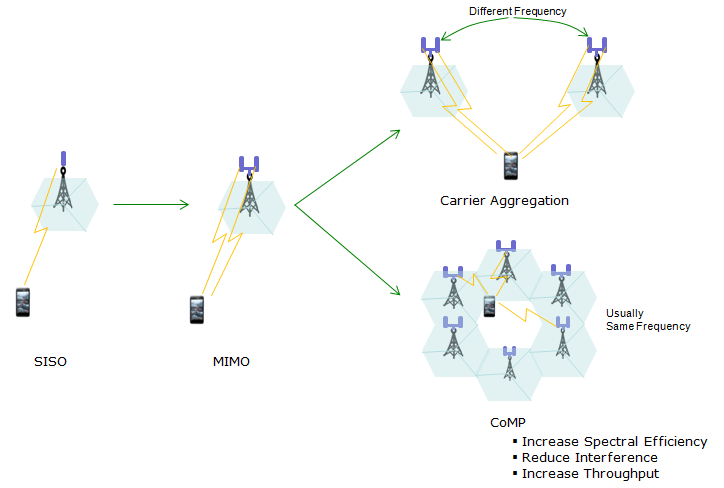 Since the initial LTE deployment, 2 x 2 MIMO has been the dominent feagure for most of LTE device and LTE network. Then another evolution for throughput improvement started being adopted. It was Carrier Aggregation (mainly Carrier Aggregation between two different bands). Once the throughput evolution by Carrier Aggregation is implemented, another path of evolution is being discussed. This new evolution path also eventually lead to throughput improvement, but direct effect of this evolution would be to increase spectral efficiency especially in cell-edge area and decrease interference between multiple cells by letting UE communicate with multiple cells in specially coordinated manner. This new technology is called CoMP (Coordinated multi-point operation). to increase the system throughput (See following 'Note'). Note : I just learned (after discussion with expert engineer in this area) that the CoMP does not support special Multiplexing between TPs, so there would be no increase of the throughput in terms of Max throughput on UE side. According to 3GPP TR 36.819 V11.2.0 (2013-09), 4 different scenario were proposed for the situations where CoMP can be benificial and these fource scenarios are illustrated as shown below. Homogenous Network : a network composed of all the base stations belong to the same type and power class. Heterogenous Network : a network composed of different base station type and different power classes. This type of network may be exposed to harsh intercell interference between the macro and the low-power nodes, due to their closer proximity and different power classes. 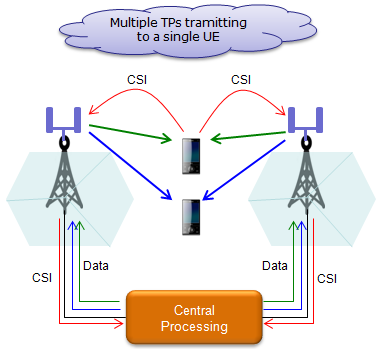 Multiple coordinated TP (Transmission Points) shares only CSI for multiple UEs and data packet that is destined to a specific UE is available only at one TP. In CB, power level and the beamforming coefficients are calculated to achieve some common SINRs in the system or to maximize the minimum SNIR. In CS, a network is divided into multiple clusters and apply centeralized scheduling within each cluster in order to determine which TPs in the cluster should transmit in each time slot and to which UE. CS/CB is a technology that jointly use CB and CS. It can be regarded as a special form of JT. This technique enables UE to be dynamically scheduled by the best TP by exploiting changes in the channel fading condition. 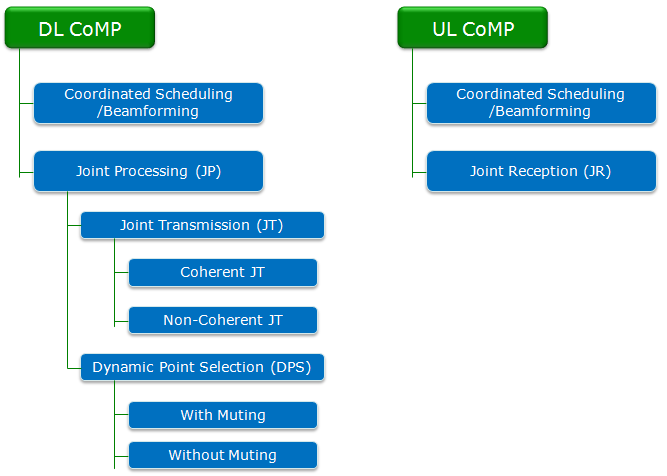 As the name (CoMP : Coordinated Mult-Point) implies, CoMP is operating in the unit of multiple points. This multiple points participating in CoMP is called a 'Set'. There are two large categories of CoMP Sets as described below. CoMP Operating Set is a multiple geographically separated points participating in CoMP operation. Each points within a set can either directly or indirectly participates in CoMP operation. CoMP measurement set is a multiple geographically separated points about which a UE perform measurement (CSI) and report the result. 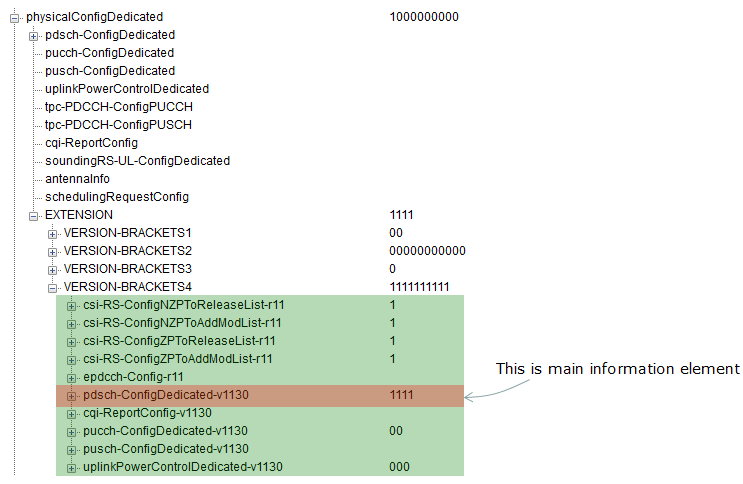 Following is the overall structure of RRC Message information elements related to CoMP. This is just summary and I think it will take several month for me to come up with all the details. As of now (Feb 2015), I haven't seen any chipset that support CoMP and I think it will take at least several month before we hear of the chipset supporting this feature. I will keep updating the details as I learn further. 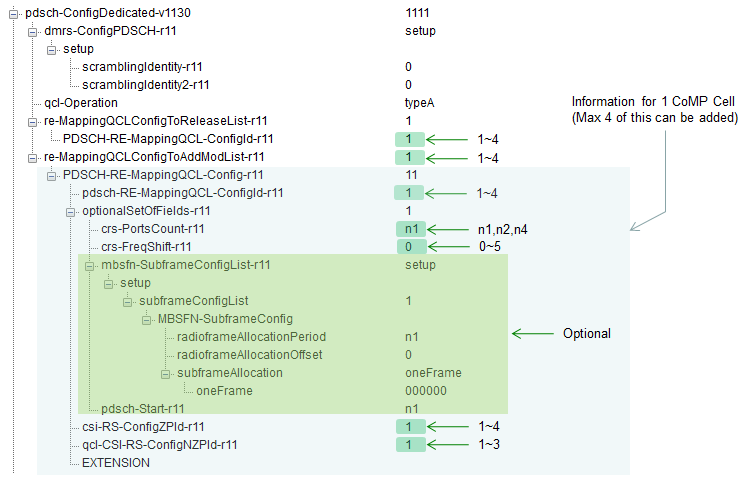 csi-IM-ConfigToAddModList : For a serving frequency E-UTRAN configures one or more CSI-IM-Config only when transmission mode 10 is configured for the serving cell on this carrier frequency. 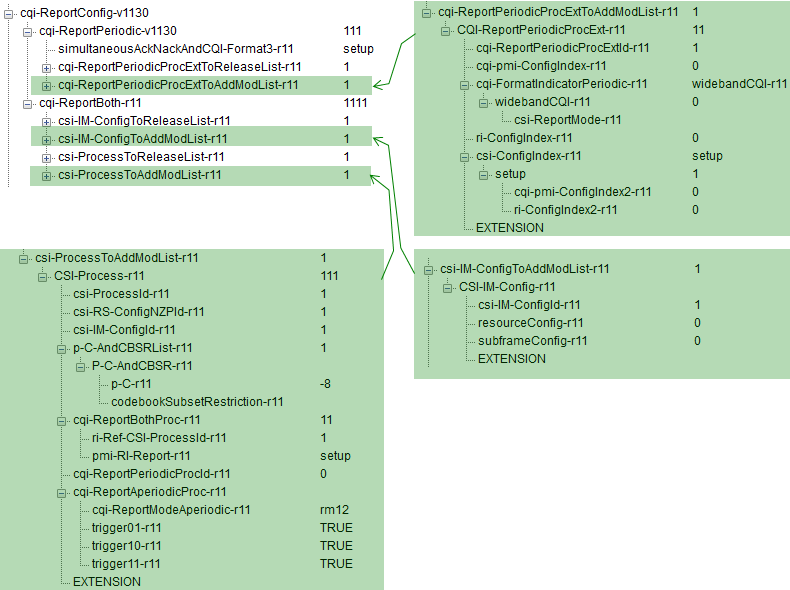 csi-ProcessToAddModList : For a serving frequency E-UTRAN configures one or more CSI-Process only when transmission mode 10 is configured for the serving cell on this carrier frequency. 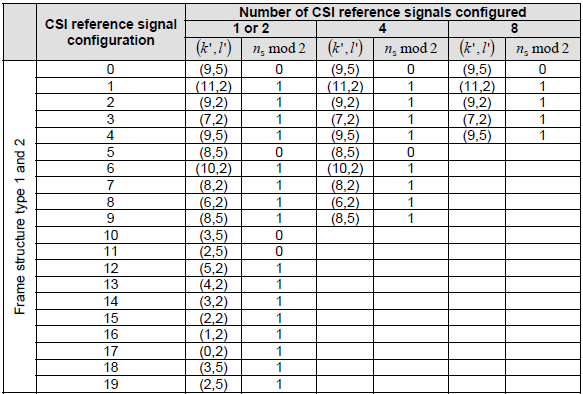 resourceConfig : CSI reference signal configuration, see TS 36.213 7.2.6 and TS 36.211 table 6.10.5.2-1 and 6.10.5.2-2] for 4 REs.